Histoplasma capsulatum var. duboisii (Hcd) infection is also known as African histoplasmosis because it has only been described on that continent, mostly in Central and Western Africa. Hcd is dimorphic – growing as a filamentous fungus at ambient temperature and a yeast at body temperature – but it differs morphologically from H. capsulatum var. capsulatum by the typical production of a large-celled yeast form. The yeast cells average about 10 μm in diameter. They are thick walled and round or oval. They reproduce by a single bud which can equal the size of the parent cell. Spread is by inhalation of microconidia which can affect all age groups, but particularly persons in their second decade. Histopathologically, the fungi accumulate within macrophages where they grow and bud, forming a granuloma made up of very large giant cells comprising fungi with surrounding inflammation and fibrosis. Diagnosis is made from a biopsy specimen or from pus or exudates. Clinical presentation may be localized with isolated skin, bone, or lymph node infections or disseminated with multiple cutaneous lesions present all over the body, subcutaneous abscesses, enlarged lymph nodes, liver and spleen, and visceral organ enlargement. This report is to share our experience in the management of this condition in an immunocompetent patient. 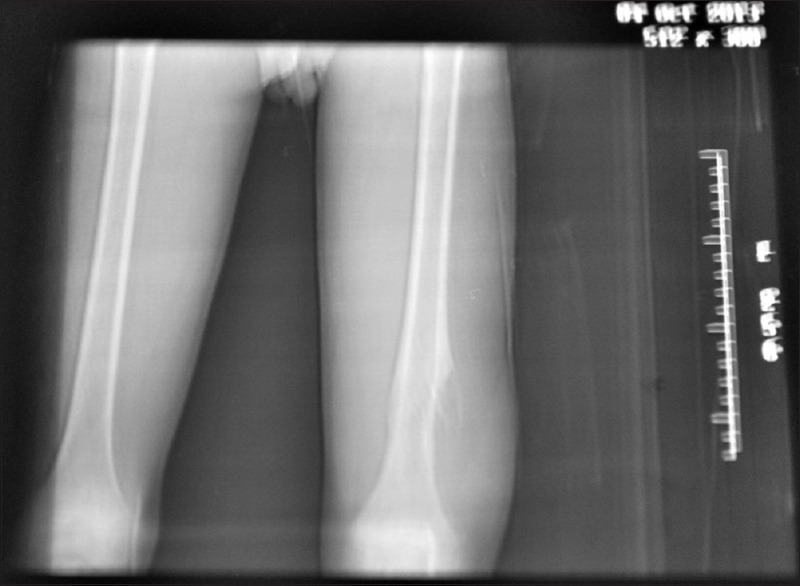 We evaluated a 9-year-old boy from Onitsha, Nigeria, who presented with a 5-month history of left thigh swelling which progressively increased in size and became painful. He had had no preceding similar swelling or constitutional symptoms. However, about 2 months earlier, he was said to have been treated over a period of 1 month by a traditional bone setter for a presumed left femur fracture sustained in a pedestrian injury. Physical examination revealed a differentially warm, firm, slightly tender mass measuring about 6 cm × 4 cm in the anterolateral part of the distal left thigh. It was not attached to the overlying skin but partly fixed to the underlying structures, and the range of motion of the knee joint was reduced. 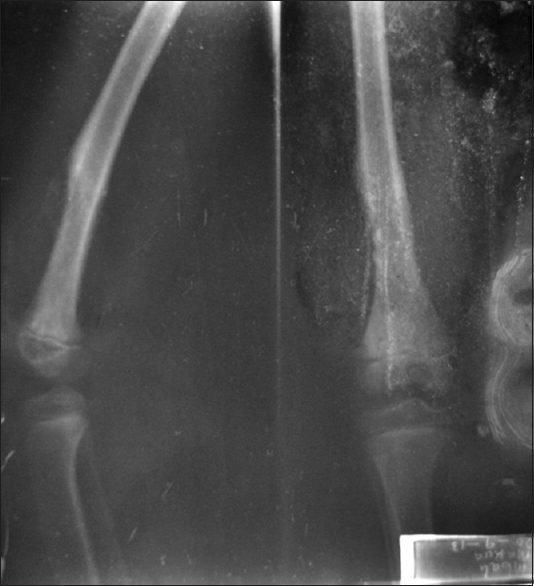 X-ray report showed a reduction in the corticomedullary differentiation of the distal metaphysis of the femur with soft-tissue swelling, preserved fat plane, spiculated periosteal reaction, cortical erosion, and cauterization [Figure 1]. Computed tomography (CT) scan report showed a reduced corticomedullary differentiation in the distal metaphysis of the femur with a sunray periosteal reaction with cortical erosion and a hypodense avascular soft-tissue mass in the distal femur [Figure 2]. Both X-ray and CT scan reports were in keeping with Ewing's sarcoma. The patient was HIV negative and he had a packed cell volume of 35% and total white cell count of 11.4 × 109/l with differentials of 89% neutrophils and 11% lymphocytes. Intraoperative findings when an open biopsy was done included a fibrocystic mass containing brownish fluid situated on, but not attached to the anterolateral portion of the distal femur. 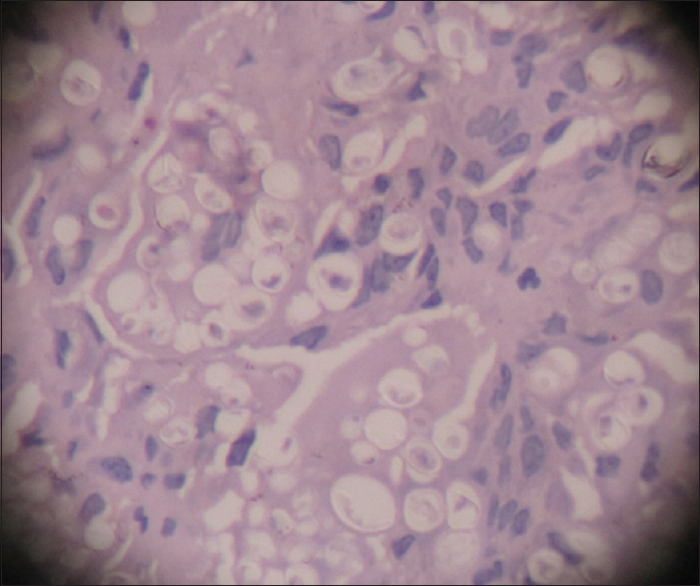 Histology report from the biopsy showed numerous histiocytes and a few multinucleated giant cells. Many of the histiocytes have eccentrically located nuclei with cytoplasmic vacuoles containing figure-of-eight-shaped bodies. Similar bodies were also seen in the giant cells and also extracellularly [Figure 3]. The fungal bodies were also identified using periodic acid–Schiff-staining technique [Figure 4]. Postoperatively, he had a course of analgesics and antibiotics. When the lesion was confirmed to be of fungal origin, he was commenced on oral itraconazole (200 mg) daily. The surgical incision healed uneventfully, and the patient was discharged home 2 weeks later on oral itraconazole, which he took for a year. 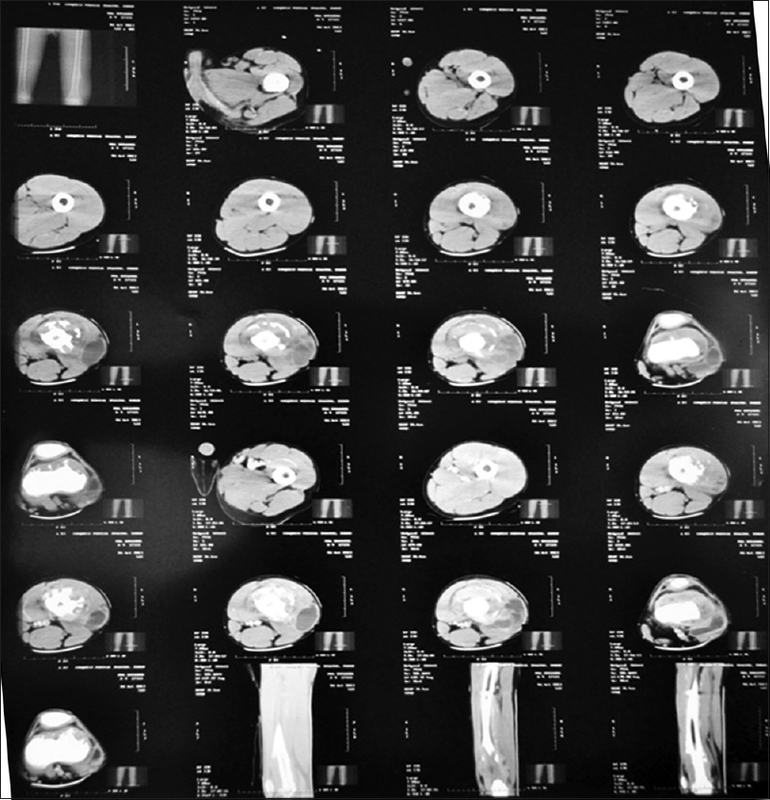 Follow-up in our hospital continued for the next 2 years and included clinical examination of the patient and x-rays of the affected femoral bone [Figure 5]. Subsequently, follow-up by telephone communication with the father was used to inquire if any swelling like the initial one treated has developed. There has been none. Whereas the fungus is generally thought to be transmitted to humans by inhalation of airborne microconidia or fragments of vegetative hyphae,, transcutaneous infection has been reported following direct inoculation subcutaneously or into deeper tissues. Once exposed, infective cells may remain quiescent for months or years before the development of disease. It is possible that our patient got a direct inoculation into his tissues while receiving treatment from the traditional bone setter few weeks before the onset of symptoms. Although Hcd infections have been known to be most frequently seen in immunodeficient individuals in whom the infections are often of the disseminated type, the disease also occurs in the immunocompetent. In fact, of the 17 cases in a series from Togo, all but four cases (three in patients with AIDS and one case associated with tuberculosis) were in immunocompetent persons. In the case presented, the lesion was found lying on the femur deep to the muscle mimicking a bone tumor on plain radiograph and CT scan. It has been previously documented that unlike classical histoplasmosis caused by H. capsulatum var. capsulatum, infections caused by Hcd are often restricted to the skin or subcutaneous layer occasionally and involving bone., While superficial cutaneous lesions occur as nodules and papules that may ulcerate at a later stage of disease progression, deeper lesions are warm, firm, and tender. Such deep-seated lesions may sometimes rupture and discharge a yellow–brownish fluid containing fungal cells and progress to a chronically draining sinuses., These, however, were not seen in our patient probably because of early diagnosis and treatment. Rapid diagnosis of histoplasmosis in Africa is only currently possible using microscopy; antigen testing and polymerase chain reaction are not available in most of Africa. Microscopic confirmation of Hcd in biopsy or secretion specimens is considered necessary to make a diagnosis of African histoplasmosis because the wide array of clinical presentations will preclude using clinical features alone to make a diagnosis.,, The “hourglass” or “figure eight” budding forms are typical of Hcd because the buds remain attached by a narrow isthmus to the mother. Histologically, lesions consist of a granulomatous reaction of multinucleated giant cells, epithelioid cells, and lymphoplasmocytes with ovoid yeasts. This picture is said to be quite classical and allows a reliable diagnosis even without mycological culture. Treatment of Africa histoplasmosis involves surgical clearance of isolated cutaneous lesions and antifungal drug therapy for deep lesions and disseminated disease. Most treatment approaches of African histoplasmosis are based on the better-studied therapeutic strategies used to treat classical histoplasmosis. Our patient, being immunocompetent, had a 12-month course of oral itraconazole. However, in patients with AIDS, recommended therapy includes an intensive phase of 3 months with amphotericin B replaced by itraconazole (400 mg/d) for the severe forms or itraconazole alone (600 mg/d for 3 days, then 400 mg/d) for mild forms. Fluconazole is known to have lower efficacy and a higher recurrence rate with isolates harboring higher minimum inhibitory concentrations (MICs) (30). Prolonged maintenance therapy with itraconazole (200 mg or 400 mg/d) is recommended in immunocompetent because relapses may be observed several years after the first episode. Similarly, prolonged follow-up is mandatory for every patient with histoplasmosis due to variety duboisii. This report highlights the possibility of Hcd infection in HIV-negative patients, making a high index of suspicion necessary. It also shows that good clinical outcome is achievable with prompt diagnosis and appropriate treatment. Oladele RO, Ayanlowo OO, Richardson MD, Denning DW. Histoplasmosis in Africa: An emerging or a neglected disease? PLoS Negl Trop Dis 2018;12:e0006046. Loulergue P, Bastides F, Baudouin V, Chandenier J, Mariani-Kurkdjian P, Dupont B, et al. 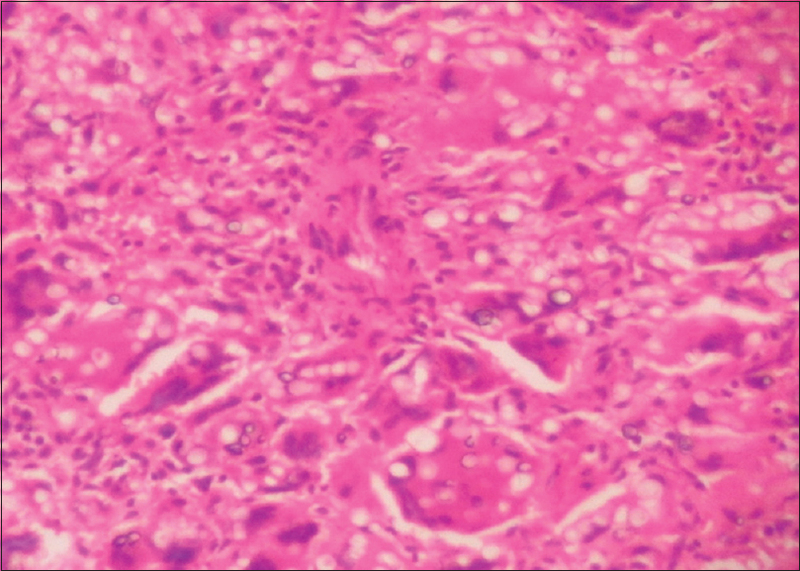 Literature review and case histories of Histoplasma capsulatum var. duboisiiinfections in HIV-infected patients. Emerg Infect Dis 2007;13:1647-52. Ravindran S, Sobhanakumari K, Celine M, Palakkal S. African histoplasmosis: The first report of an indigenous case in India. Int J Dermatol 2015;54:451-5. Gugnani HC. Histoplasmosis in Africa: A review. Indian J Chest Dis Allied Sci 2000;42:271-7. Tsiodras S, Drogari-Apiranthitou M, Pilichos K, Leventakos K, Kelesidis T, Buitrago MJ, et al. An unusual cutaneous tumor: African histoplasmosis following mud baths: Case report and review. Am J Trop Med Hyg 2012;86:261-3. Darré T, Saka B, Mouhari-Touré A, Dorkenoo AM, Amégbor K, Pitche VP, et al. Histoplasmosis by Histoplasma capsulatum var. duboisii observed at the laboratory of pathological anatomy of Lomé in Togo. Journal of Pathogens 2017;2017:2323412. Kasuga T, Taylor JW, White TJ. Phylogenetic relationships of varieties and geographical groups of the human pathogenic fungus Histoplasma capsulatum darling. J Clin Microbiol 1999;37:653-63. Garcia-Guiñon A, Torres-Rodríguez JM, Ndidongarte DT, Cortadellas F, Labrín L. Disseminated histoplasmosis by Histoplasma capsulatum var. duboisii in a paediatric patient from the chad republic, Africa. Eur J Clin Microbiol Infect Dis 2009;28:697-9.